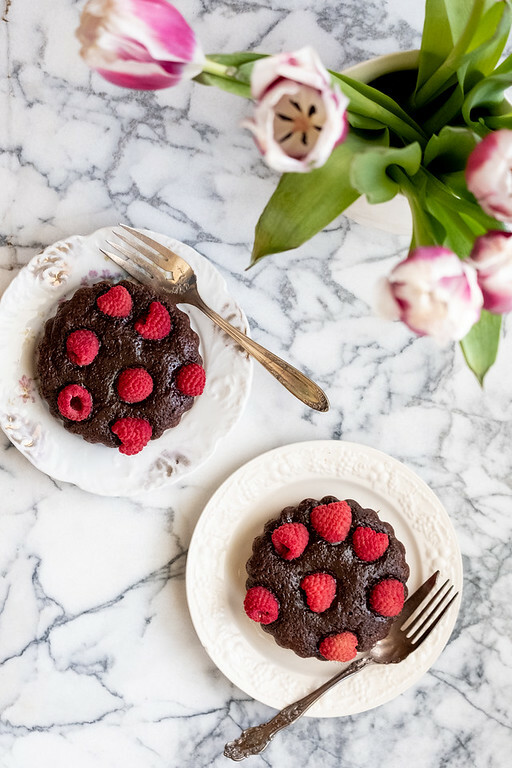 These rich, dense fudgy brownies are topped with tart sweet raspberries and baked into cute little tarts. They are bursting with decadent chocolate flavor. This is the best chocolate dessert you will ever make! It’s so easy that even someone that doesn’t bake a lot can make these! Dark chocolate, butter, sugar, cream, eggs, flour and raspberries. Do you have a favorite dessert? Mine would be anything with chocolate. For special days, like Valentine’s Day, Mother’s Day or our anniversary my husband always picks us up a huge slice of a decadent chocolate cake from a local bakery. I waned to make something similar at home. Something that had that dense chocolate flavor. Fudgy and intense. Since I rarely bake, it had to be easy too. 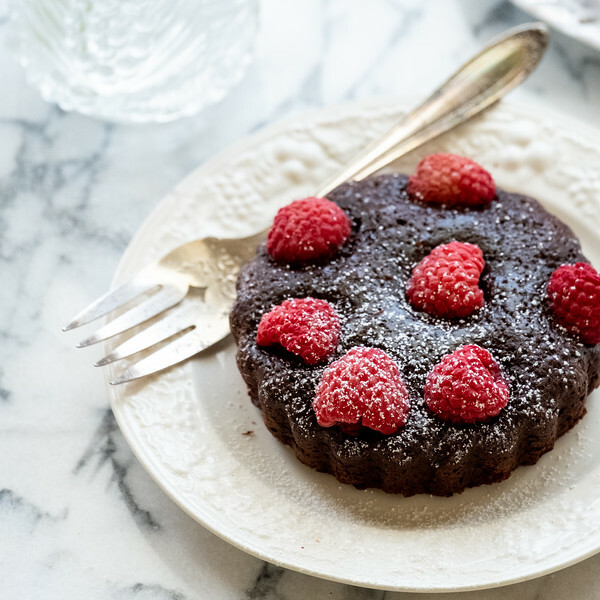 I had already mastered The Easiest Flourless Chocolate Cake, but I wanted to try something new. 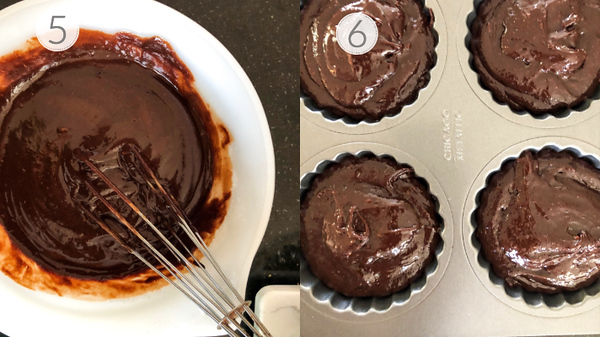 What I love about this easy chocolate dessert (besides how amazingly delicious it is) is that I almost always have the ingredients to make in in my pantry and fridge. All I need to do is run to the store and grab some raspberries. Dark Chocolate – Use a good quality dark chocolate – 60% or better. Brown Sugar – light or dark. Cream – can use half and half, whole milk, light cream. Raspberries – 1/2 pint (6 ounces) – you won’t use all of these. Step 1 – Lightly grease four 4×4 tart pans and line with parchment paper. A pop up bottom, makes removal easier. 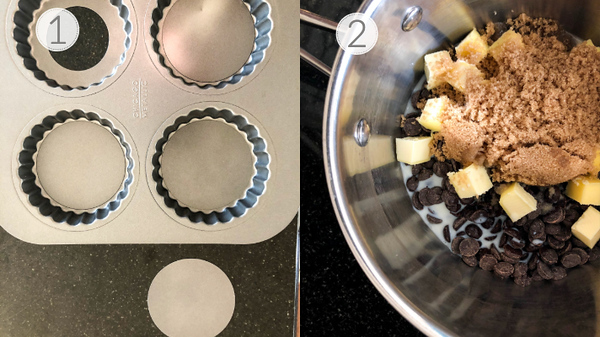 Steps 2 – add chocolate, brown sugar and cream to small sauce pan. Step 4 – Whisk 3 eggs in a bowl. Add a spoon or two of the chocolate and whisk it in. 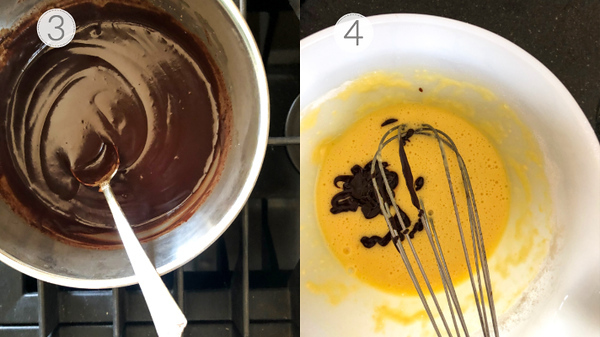 Step 5 – Whisk in the rest of the chocolate. Step 6 – Pour into tart pans. (Not Pictured) Top with raspberries. I used about 6 per tart, you can use more or less. Bake for 35 to 45 minute or until toothpick inserted in center comes out clean. Let cool for about 15 minutes and then remove from pan. Top with a little powdered sugar if you like. Oh my. What can I say about this lovely little tart that will do it justice. It’s crazy easy. I have already made it again (twice in one week!) and will probably make it again in the very near future. It would be the perfect Valentine’s day dessert. It is rich and chocolatey with a bit of tart sweetness from the raspberry. I found this recipe in an old Donna Hay magazine. The original recipe served with a chocolate ganache, but it didn’t need it! 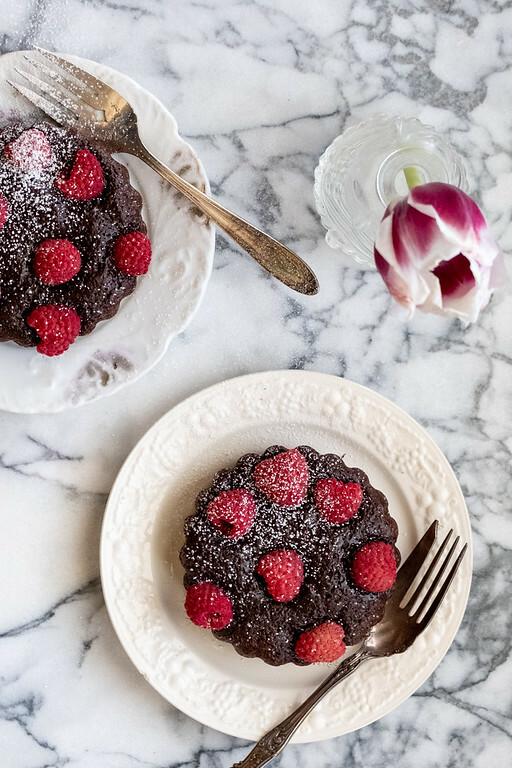 These Dark Chocolate and Raspberry Brownie Tarts are perfect for Valentine's Day - or any day really! Preheat the oven to 300. Lightly grease 4 4x4 tart pans and line with parchment paper. Place the chocolate, butter, sugar and cream in a medium saucepan and heat over low stirring often until chocolate is melted and smooth. Place the eggs and flour in a bowl and whisk until combined. Whisk in the chocolate mixture until combined. Pour into tart pans and top with raspberries. Bake for 35-40 minutes or until cooked when tested with a skewer. (Note I used 300 degrees in my convection oven and they came out perfect, if you have a regular oven you might want to bump it up a bit). Bake for 35-40 minutes or until cooked when tested with a skewer. (Note I used 300 degrees in my convection oven and they came out perfect, if you have a regular oven you might want to bump it up a bit). Dark Chocolate - Use a good quality dark chocolate - 60% or better. Brown Sugar - light or dark. Cream - can use half and half, whole milk, light cream. Raspberries - 1/2 pint (6 ounces) - you won't use all of these. (Note I used 300 degrees in my convection oven and they came out perfect, if you have a regular oven you might want to bump it up a bit). This post was originally published in 2014 and updated for 2019. These sound really good. By looking at the ingredient list I’m thinking I could even make these gluten free for my son. Thanks Pam for always sharing such lovely desserts. With so little flour, these would be easy to convert to gluten free! They look so good. A perfect Valentine’s treat. Oooooh, chocolate & raspberry together = heavenly.